Ever tried to make Crème Brulee at home without using an oven? I love this French dessert, with rich custard base and topped with a layer of crunchy caramelized sugar. 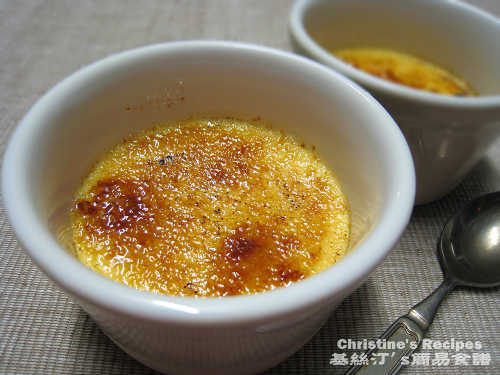 This well-known French dessert, Crème Brulee is widely accepted. Yet not all restaurants offer such a supreme dessert in Australia, only offered by some prestige ones. So I tried to make some for my family some time ago. Although it’s not difficult to cook this dessert, I found it took nearly an hour to bake them. 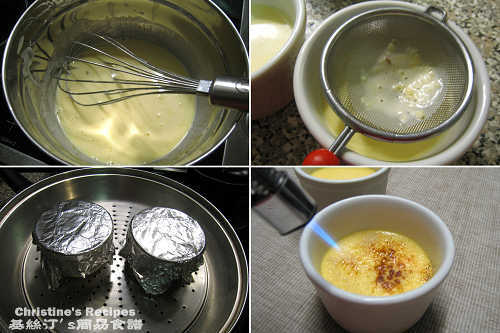 Here I found an easier way to make delicious crème brulee, saving much electricity, energy and cooking time with very good results. Sounds great? Lightly whisk egg yolks. Add in white sugar, thickened cream, milk and ginger juice, mix well. As you don’t want to have any foams appeared on the surface, so just combine the ingredients, not to beat them. Sift egg mixture into ramekins in order to have smooth custard. Cover ramekins with foil (see picture shown above). Use a wok or steamer, steam for 10 to 15 minutes over medium-high heat with a lid. Insert a toothpick in the middle of custard to test if they are cooked through or not. If the toothpick comes out clean, they are done. Let custard cool and refrigerate for 1 to 2 hours to set up. Generously sprinkle raw sugar on the surface of custard. Torch it. Let the creme brulee cool for just a minute. Enjoy! You can use a teaspoon of vanilla instead of ginger juice if you like. Well, this is a traditional way of making crème brulee, I know. However, I love the taste of ginger, just going so well with the custard. Yummy! Christine- thanks for replying to my comment on the coconut pudding. I tried your suggestion to lower the oven heat (at 121 C instead); I also tried lowering the heat in conjunction with covering the cake with aluminum foil. Both methods worked much better (the uncovered one looked a bit prettier, although still not as pretty as yours!). And yes, Jessica is my friend-- she is going to love this creme brulee recipe; it's her favorite dessert! Glad to hear that you've tried with better results. I think 121C is too low. You might like to try 150C or 160C next time. If you lower the heat, then you don't need to cover the cake when baking. Yeah, Jessica also left messages on this blog several times. Hope she enjoys the creme brulee. Hi, I tried making creme brulee yr way, it turned fairly good but I noticed the texture was a bit grainy instead of thick and creamy. I frgot to cover it with foil when steaming. Was this the cause? I guess it could be the cause. Without covering the custard with foil, the steam would condense and some of them would change into water on the custard, making the custard runny. Mine was very thick and creamy. The texture was like those creme brulee baked in oven. You might like to try again with foil to see if you're satisfied with the result or not. Luv this quick variation! Must go to get some ramekins now! Hehehe! hi christine..thankyou sweetie for dropping by n even following my blog.......i am a new blogger n it's great encouragement. came here to see a wonderful cream brulee.....looks so inviting n i have to try it.....only , i don't have a blow torch, can it be caramelized any other way? Love to explore new blogs. I found your great one so I added you to keep me updated with your new posts. Well, a friend of mine tried to caramelize her custard with grilling in an oven. She said that she's quite satisfied with the result. You might like to try to see if it works for you. MMMMM...they look so lovely & inviting!! Yummie! Mine turns out really grainy and watery, i did put foil, i follow every steps, i turn oven at 120C to cook for about 35 mins, what went wrong? The steaming method was used in this recipe. If you want to bake this dessert in an oven, you don't need to cover with foil. And the temperature of 120C was too low. Try 150C and bake for 35 to 45 mins next time.